Over the weekend, the main building at Camp Mack, near Milford, Ind., burned. The camp, which is owned by the Church of the Brethren, is named for Alexander Mack, the founder of the Brethren movement. It has frequently been used by Grace Brethren groups in Indiana. Below is part of an account from the Warsaw, Ind., Times-Union. To read the complete story, click here. MILFORD – One person was trapped but suffered no injuries in a fire at Camp Mack over the weekend. 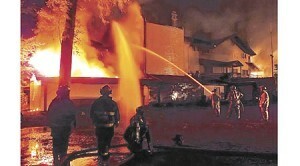 Firefighters were initially called to a fire around 4 a.m. Sunday to a blaze at the camp’s Becker Lodge. The three-story building houses the camp’s main office, kitchen and dining areas, and staff housing. Fourteen people were sleeping in the building when the fire started, and one person was trapped upstairs and was rescued through a window. The man, who was not identified, suffered minor smoke inhalation, but was expected to be fine. No campers were at Camp Mack at the time of the fire Sunday morning, but campers arrived Sunday afternoon. The camp is still open with a few changes. Read the complete post from Monday’s Times-Union.